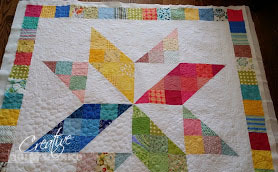 Julia made this colorful modern star quilt. The photo below is how it looks after she quilted it. I love the cute little circle pattern she quilted. Julia found the pattern for this star quilt at Moda Bake Shop you can find the pattern here. Her comment after making this quilt was,. "You end up cutting the patchwork in half and you don't have clear points and that bothered me until it was all done and then it was fine." So her comment got me thinking about other ways to make this pattern and the points really would not matter at all. The idea I came up with was to "make" fabric instead of piecing with the charm squares. 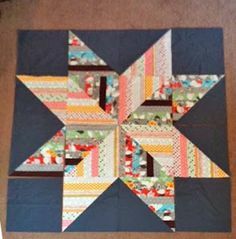 What I mean is use the color placement from the Moda pattern but make the squares totally scrappy like this picture below. You can find this picture by clicking here. The other idea I had was to "make" strip fabric instead of the charm square piecing and use the color placement from the Moda pattern. Here is a quilt using strips of fabric just to get my idea across. 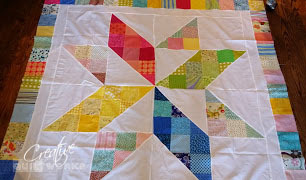 Anyway, I am intrigued by these star quilts and I love the colorful quilt Julia made. Maybe, I'll try making all three...Until then, Happy Quilting! !